Informed and thinking Filipinos know that Fr. Conrado Balweg is dead. I am posting this decade old piece to provide some background about his life, his milieu, the thoughts and ideas on what propelled him to become a revolutionary. Fr. Balweg interpreted the Christian teaching of "loving one's neighbor" in its social application, in his particular milieu, his community, his province and region. He discovered and learned that reform, characterized by slow, if not impossible, process of change, does not and will not really solve the centuries old socioeconomic problems, because the power elite, i.e. economic and political, does not want change. Of course, we know that he has been murdered. But there would be another or more Balweg(s) inasmuch as the socioeconomic and political conditions that existed then and helped make him take arms and fight the ruling regime, still do now. "Ninoy is our hero... Balweg is our idol." This sign, usually put up in Pentel red, has lately been seen in a number of places in the Mountain Province. It has recently been noted by a reporter on the highway between Tabuk, the capital of Kalinga Apayao, and Baguio, the summer capital of the Philippines. Balweg is, of course, Conrado Balweg, S.V.D., a graduate of one of the main seminaries of the Society of the Divine Word and until a few years back a relatively unknown priest of a rural parish in Abra, a province in Northern Philippines. Given holy orders and designated as an S.V.D. missionary in 1971, few have heard of or known much about him before 1979 when, according to military records, he fled to the hills and joined the New People's Army (NPA) in the Cordilleras — that massive wall of mountains that cuts through the northern portion of the country and which has been the home of a number of the so-called Filipino "national minorities." The military has since then identified him as the leader and mastermind of a number of NPA attacks against military outposts, bases and detachments in the Mountain Province area in which soldiers and officers of the Armed Forces of the Philippines have been killed and dozens of armaments have been secured for the military arm of the Communist Part of the Philippines. About a year ago, the very high price of P200.000 has been placed by the military on his head — sort of 'like a crown of thorns," as one writer has put it — to make him literally one of the most wanted men in the country. The fact that the "idolization" of Balweg has become considered by many as a transcendental political act to the heroism of Ninoy is by no means a matter of personal or private achievement on Balweg's part. It is clearly a matter that has arisen as a result of the critical twist that has overcome the flow of Philippine political life. The fact, too, that Balweg has become in a very short period of time one of the most well-known and written-about Churchman in the country — comparable and perhaps second only in recent media coverage to Jaime Cardinal Sin, the now critic of and then now collaborator with the Marcos regime who is archbishop of Manila and the acknowledged "head" of the Catholic Church in the country — is equally by no means a matter of Balweg's attainment of hierarchical status within the Philippine Church. It is clearly a matter that has arisen as a result of the emergence and the growing impact within Philippine Church and society of that radical form of piety that looks at the revolutionary option as the most proper expression of its spirituality and service to God. While to many the transition from Ninoy's "heroism" and Balweg's "idolization" is not difficult to see and seems native to the logic of liberation in the Philippine context, the contrast nevertheless between the two personalities is quite striking. Ninoy made his impact and built for himself a significant place within the main stream of Philippine politics. From his college days onwards, and especially from the time he became a young Philippine correspondent in Korea during the Korean war, Ninoy has been a public figure, quite endowed with the means, the connections and the charisma that are necessary for the type of political warfare in the mainstream. He was born in a relatively well-to-do family with deep roots in Philippine politics. And he got married to a Cojuangco — one of the wealthier families in Central Luzon whose social and political prominence are well-known throughout the country. Indeed, from the moment Ninoy actually entered political life, few doubted that his sights were focussed to no less than the ultimate occupancy of the presidency of the republic. 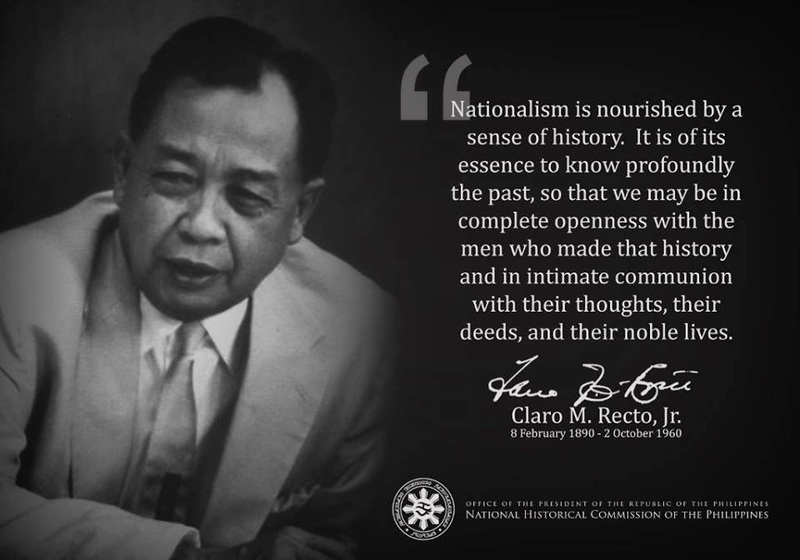 That his time coincided with the "era" of the Marcoses — whose aspirations for greatness and control of Philippine politics are unequalled to this time — has clearly been a major part of his political frustration and the final cause of his "martyrdom" and the occasion of his "heroism." Balweg, on the other hand, comes from the opposite end of the social and political spectrum. He was born to a poor, rural family. He is, in fact, a native Tingguian — one of the "tribal minorities" in the north whose lowly social condition has been the object of derision and charity from the more affluent and "advanced" ethnic groups in the lowlands. His schooling has been through the rural school system, and mainly through the mission schools that have been set up in the Tingguian areas. He grew up, in short, not amidst the tingle, awe and often vociferous lifestyle of the political public but amidst the very simple, quite subdued and traditionally very religious ambience of Catholic piety with its novenas, rosary meetings, and prayer rallies. There were no ambitions or aspirations of political prominence within his family. Indeed, under the conditions in which he lived as a child, such ambitions were beyond imagination. The family ambitions were more on the religious side: two brothers wanted to become priests and a sister wanted to become a nun. He himself began to admire, as a child, the pacifist teachings and anti-Communist leanings of the Catholic fathers who frequented his village and who taught in his school. Religious aspiration and more specifically clerical ambitions within poor, feudal societies have, of course, always had a social content to it.- And Balweg was no exception to this fact. Thus, when finally he himself decided to be a priest, it was not so much because of the religious example and piety of the SVD fathers but more because of the chauvinism and anti-Tingguian prejudices of his non-Tingguian classmates. Becoming a priest, he thought, would be one way of regaining for himself and for his tribe the dignity they have not received because the priesthood is considered by all as among the most dignified and the most respectable of all the professions. The religious profession, in other words, is one sure way by which he might break out of the social imprisonment of his tribal origins, and possibly bring release to the political imprisonment of his people. This integral combination of religious vocation and social passion which was so dominant and primordial to Balweg's religious upbringing became also a primary ingredient of his further religious formation. The seminary became for him not a spiritual cocoon in which one is nurtured in sheltered piety but a place in which the horizons of his concerns became expanded beyond the Tingguian world. It was also while in seminary that he began to learn and to experience that the demands of human need and social relevance are prior to the formal prerequisites of religious discipline and constitute in fact the primordial content of true spirituality. Thus, he was chastised many times by seminary authorities for breaking seminary discipline in favour of doing relief work and social service in the villages outside of seminary grounds, and for interjecting into seminary life the heightening imperatives of national social redemption. Thus, also, he became involved during his seminary life in the activities and demonstrations of the "First Quarter Storm" and his ordination became questioned, after over thirteen years of seminary training, because his religious worthiness was suspect to some of his superiors. Thus, finally, when he received the sacrament of Holy Orders, he looked at this "holiness" as the freedom and the calling to put religious belief into concrete practice, and to practice justice as the central content of Christian spirituality. It is equally this integration of religious vocation and social passion , on the one hand, with a revolutionary political practice, on the other, that has thrust Balweg pretty close to the center-stage of current Philippine political life and very much a focus of public attention. Ninoy, the natural political practitioner and public figure makes a heroic return to the country, espousing justice and pledging enmity to dictatorial rule but eschewing violence is violently cut down by an assassin's bullet while in the custody of those who are supposed to maintain peace and order. That is one form of political sacrifice under the current authoritarian dispensation, and it has not only attracted public attention but also roused up a whole population into protest and anger over the continuance and decadence of the present' regime. As the impact of that assassination and the "willing sacrifice" that precipitated it begins to wane however, and as its consequence becomes rechannelled into the "normal" politics of electoral reform, the figure of Balweg, the "unnatural" political practitioner, whose nurture and preparation has been within the relatively sheltered ambience of the religious, comes into view. He too espouses justice not only as the natural order of social relations to which all therefore are naturally bound, but more importantly as the substance and primordial goal of the Christian life. So strange to so many people is the fact that he does not eschew violence. The figure in fact carries a gun, and actually engages in the practice and pursuit of revolutionary politics. When asked why he carries a gun, he replies calmly but firmly, and profoundly analytically, that the native injustice and violence of the present economic and social system and the manner in which that system is maintained and imposed upon the poor, the deprived and the oppressed inevitably demands the purposeful and resolute exercise of counter-violence if justice is to be served and practiced. The practice of the revolutionary lifestyle, with its untold demands of privation and sacrifice, its renegade existence, its dangerous risk of death and torture, its ideological commitment and persistence, and most importantly, its total immersion — like fish in water — in the condition and predicament of the people on whom injustice has been heaped becomes the ultimate expression of sacrifice to God and the historical manifestation of that costly but vulnerable discipleship that is made imperative by the act of Divine incarnation in a world of suffering and oppressed peoples. It is not, of course, the first time that radical and revolutionary politics has been espoused and practiced on Christian grounds. Michael Walzer in his The Revolution of the Saints has detailed the contribution of the Calvinist "saint" in the transformation of politics into religious work and in initiating a new stage of political intervention that is infused with religious passion and conscience. In our own national history, there are examples of "revolutionary clergy" — to use the words of John N. Schumacher — who broke the bounds of traditional and normal Christian political engagement in their involvement in the nationalist struggle. Still, however, the figure of a religious holding a gun and refusing various forms of enticements by military and some Church superiors to "come down from the hills" and engage in "friendly dialogue" with the "unrepentant" and defiant response of "come and get me" is strange if not shocking to most, mystifying to some, and fascinating if not challenging to a few. What gives strangeness and shocking impact to the revolutionary figure of Balweg is the fact that ingrained quite deeply in the Christian psyche is a tradition that separates drastically the vocation of "saintliness" from the public, and more specifically the political, life. Writing in the second century A.D., the Stoic philosopher Epictetus listed politics among those things which are "not in our power." "Be ready," he advised his fellow Romans, and especially those who are devoted to the vocation of the contemplative and the philosophical life, "to say that it does not concern you." His was of course a warning against ambition and the pursuit of political office, but it also represented a turning away from political interests and activities, a radical severance of private needs and aspirations from the public world of cities and empires, which somehow had become prominently incorporated into the Christian understanding of spirituality and "saintliness." Thus, as the philosopher, in Epictetus' view, cultivates internal things and must be prepared in regard to the external world of the political life to take an inferior position, fulfilling only his designated role and doing his job honorably, so also, and perhaps even more so, the "saint." Politics, in short, is a matter that belongs to the "princes," and "commoners," and most especially the "saints" must not dabble in it. "Commoners" and "saints" are "non-participant" subjects whose political existence had one identical characteristic: that they are obedient and subservient to predetermined commands and roles that are promulgated outside of and beyond their control and power. While this Medieval structure of "non-participant" subjects and universal empire have long been shattered, the view nevertheless prevailed and continued to be practiced that "commoners" are only peripheral to the political process and "saints" are drastically severed from it. If the religious have a role at all in politics, it is that of giving moral advice and consent if not religious sanction to the work of the "princely" political practitioners; they are not however to intervene directly or to participate fully. The Christian revolutionary, whenever and wherever he or she appears in the horizon of political and ecclesiastical life, thus becomes relegated by established Christianity and by the established political powers to the ambiguous world of sectarian heresy or to the lunatic fringe of Millenerian longings and aspirations. That was what was done with Thomas Muntzer at the turn of the Reformation, and that too was what was done with the Taipings at the beginning of China's modem political history. Balweg, however, is not and cannot be dismissed as a Millennerian lunatic. His theological and religious nurture has been in fact within the mainstream of Catholic orthodoxy and his politics embodies not the fanciful and often frivolous "mumbo-jumbo" — to use the words of Renato Constantino — of religious fanaticism but the "scientific" logic of the ideology and organization of a movement whose revolutionary impact around the world is based upon its claim to be not at the fringe but at the center of history and political life. Christian discipleship in our time. Revolutionary politics, whether we like to admit it or not, constitutes a major ecumenical frontier that must be examined and given attention to, especially if we are, to give substance and practical importance to what the Catholic Bishops of the Philippines have said is the Christian's "preferential option for the poor." It is not, of course, the first time that the question of revolutionary politics has intruded into ecumenical consciousness. The current concern over a theology of liberation can in fact trace its lineage to an earlier lively debate over a theology of revolution that had become quite prominent and influential in ecumenical discussion of Church and society. Though that search for a theology of revolution has now been shunted to the periphery of ecumenical debate in favor of safer and less controversial issues, its legacy remains and continues to give focus to current concerns for Christian participation in the transformation of society. The theology of revolution never waivered in pointing out the primordially political character of our social predicament and of the responses we might give in relation to it. It refused to accept — in the words of Charles C. West — that the frontier of social concern "lies in the conquest of nature for the transformation of human life," as the technologists would say, and insisted that that frontier lies in the struggle and victory over "the all-too-human demons of power and greed in the conflict between man and man." It pointed out the ideological character of the privatization and internalization of Christianity and sought a political theology that consciously denounced the practice and the theology that severs Christian spirituality from political engagement. It posed before the Christian community a critique of the prevalent theory and practice of development, with its "hidden" capitalistic orientations, and counterposed alternative ideologies and methodologies of social transformation. It persisted in focussing attention to the means and not only to the ends of social transformation and of Christian involvement in social and political change. It refused to be satisfied with "theory" but sought Christian "action" as the real vehicle of involvement. It looked at social problems "structurally" so that social transformation cannot take place by merely throwing certain "rascals" out of the social and political system. It above all sought to see the human dimensions of revolution and to recognize that "novelty" and "discontinuity" are not only important ingredients of the attainment of justice and true humanity but are also integral to the very character of God's action in the world. It is the creative dimension of the revolutionary option and its intense passion for novelty in social life which the "Christian revolutionaries" of Nicaragua, for example, pick out as their theological point of entry. 'There are people," they declare, "who are playing with what is sacred. . ." and therefore ". . .have no eyes to see newness in history nor hands willing to help create it. On the other hand, God is always new, always young, always greater than what has already happened. And for that very reason a people of women and men who grasp the creative force of the Spirit of God can always construct a new and better history than the past! (Role of Christians in Nicaragua's Revolutionary Process, p. 1). Revolutionary politics, in other words, is the political analogy of God's creative lordship over history and the whole of life. Balweg makes these issues alive in the Philippine context by the radical concreteness of his revolutionary theory and practice. What has in fact made the discussion of revolution in ecumenical circles somewhat muddled has been its lack of a specific frame of historical reference. Ferdinand E. Marcos refers to his authoritarian politics as a "revolution from the center" and to some that indeed is a revolution. The word revolution, too, has been used to refer to the impact of the latest stage of technological innovation upon society so that one then speaks of the technological and social revolutions in our time. Still others use revolution in terms of the counter-cultural lifestyle that is demanded by the "post" technological era into which we have entered. The historical and ideological context out of which Balweg poses his revolutionary challenge is specific and quite clear. Revolution is the forcible overthrow of the prevailing ruling class and the seizure of the central organs of power in order to institute thereafter new rules and structures of decision-making, new arrangements of governing and ordering society, especially in its political and economic spheres, on behalf of all. To put it differently, revolution is the violent outburst whereby the class of dispossessed men and women in society break open the shackles that have been imposed on them by a prevailing ruling class and undertake the promethean task of dismantling the whole economic, political, social and cultural order that has been set up in order to build a completely new one that is presupposed upon a different principle of social and collective existence, namely, that the control of the means and modes of production becomes "public" and not "private" and that "equity" rather than "profit" becomes the motivating factor of the common life. Sovereignty is removed not only politically but also economically and culturally from elites and vested on "the people." A. It is unequivocably and uncompromisingly from "below." It is, in short, to come and is to be generated from the least expected source of power. The "oppressed" and the "poor" who are the object of the goodwill and the concern of "good" people are the ones who will rise to unshackle not only themselves but also the whole of society from its alienation and from its enslavement and enslaving propensity. It is not going to come from the "middle" nor from the "top." It is not to come from the "brightest" and the "best." And it is not going to come from the "righteous" and the "good." It is not to be generated, in other words, by the powers of government, or of those who are entrenched and established; it is to change these. And it is not to be generated by the power of morality, the good, or the ideal. It is to emerge out of the experience and predicament of oppression, and it is to be geared towards the project of ending all oppressions. B. It is total. All aspects of social, economic and political life are going to be affected by it. Not only the entrenched, not only the economically vested will be affected. The "good" and the "religious" will be affected as well. Their role and place in society will be "unveiled" and they can not remain as they are, or become what they have traditionally hoped to be. C. It is violent. Revolution is war; it is class war. And as in all wars violence is native to it. The question is not whether it will be violent or not but in what form violence occurs and when and where it will have to be applied. Revolution in short has and should have a military arm, not only an ideational or an ideological arm. It can only be undertaken and espoused by people who are prepared to use arms, and suffer both the agony and the risks of armed conflict. D. It has a vanguard, an organized party, that leads it, focusses its efforts and its strategies, directs its activities, and insures that it remains within the parameters of its goals and projects. It is not, in short, spontaneous revolt. It is organized revolution, willfully engendered, planned and implemented. It is not mere idea, or hope, or suggestion in a general sense; it is hope with an organized mechanism for fulfillment and struggle. Is There A Balweg In Our Ecumenical Future? The ecumenical significance of Balweg lies not only in the manner in which he poses very concretely the revolutionary option which he has taken but more in the manner in which he affirms that the taking of such an option is rooted in a deep religious faith and is considered by him as an expression in our time and context of the imperative of Divine justice. He asks very sharply what other options are really available, and workable, in our present context in order to give substance to the Christian's avowed "preferential option for the poor," and in order to give practical vent to the Christian commitment to justice and to service to the people. Balweg disavows the workability and ultimate justice of gradual measures, whether these are by means of persuasion, legislation, electoral processes, or even perhaps the decentralized non-revolutionary violent confrontations among conflicting interest groups. These will, in his view, only rivert back and become domesticated into the old system with its built-in structures of power and injustice. The revolutionary cause is thus not only a political but also a moral and theological choice, in the light of which less demanding causes are in the end irresponsible if not inhuman. At the very least, what such a posture creates in the ecumenical enterprise is an ethical and a political dilemma of major proportions. Some may have already dealt with it and have made up their minds on what option to take or not to take. Others may not be as firm. There is now however a Balweg in our midst, and one can suspect that there are other Balwegs in the future. And that more than anything else is the reason why, especially as our economic, social and political life continue to deteriorate and bring countless suffering to the people, the ecumenical enterprise will be placed in a much greater position of stress and distress than it has ever been before. Interesting read, Mr. Bert. There's a lot mentioned here that I personally did not know. Thank you for this blog.